Choosing a VPN is like shopping for any other service: you’ve got to weigh up the features on offer – and the ones you’re likely to use – against the price of the subscription. While on the face of it this is no different from pricing and selecting any other subscription product, what makes things more challenging in terms of VPNs is the number of differentiating features – and the fact that novices may not even be aware of what to look for in terms of features. Also, it doesn’t help that many VPN websites run with very flashy designs, but are often short on the details of the spec and service. By spelling everything out in simple terms, this article will point you in the right direction in terms of getting the best VPN for your needs at an affordable price. Remember that a VPN works by creating an encrypted data tunnel between the user and the provider’s server. While we think about the VPN as having ‘a server’, the reality is that any VPN will need to have many servers to handle all of this traffic, and to allow many users to connect. Better VPN services will state how many servers they have. For example, NordVPN says that it has just over 1,000 servers. A larger number of servers means that the user should get more bandwidth and therefore faster speeds when connected to the VPN. You’ve more than likely heard the phrase ‘location, location, location’ when it comes to real estate, which hammers home the importance of the area in which you buy a house. Well, the location of your VPN server is equally important when it comes to your internet connection. On the one hand, having a VPN server located nearby can be advantageous for a no-lag, responsive connection, which is very useful when partaking of activities such as online gaming. Alternatively, a VPN server in another country can be an asset to overcome geo-blocking restrictions, as the user appears to be in the same country as the server and can thus access otherwise blocked content. This is how some users access the US version of Netflix from the UK, for example. Internet usage is all based on the transmitting and receiving of data. While many ISPs still have unlimited data plans, it is not so simple when looking at a VPN service. Some VPN plans offer a free tier and a paid tier. Of those that offer a free plan, the major restriction is that it offers a limited amount of data for the month, in the hope that the user will try the service out, use up the data in less than a month, and therefore decide to make the move to become a paid subscriber. One VPN, Windscribe, takes this approach with its free tier, but offers a generous 10GB of data for each month – far more than some rivals which might only give you 1GB (or even less). Once users understand the benefits of a VPN, they generally want to connect multiple devices to it simultaneously. But almost all VPN services have a cap on the amount of devices (PCs, phones or tablets) you can connect, which in some cases is dependent on the exact plan (tier) you subscribe to. For example, VyprVPN offers a lower tier that has unlimited data, but limits the user to three simultaneously connected devices. There is also a higher, more expensive tier from the same provider that allows for up to five devices. 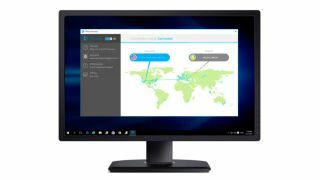 Some VPNs will allow an unlimited number of devices – for example Windscribe’s paid plan – but this is the exception rather than the rule. Just about every VPN will support a Windows PC with native software, and most major providers also have native clients for Mac, iOS and Android devices. These days, though, we use more devices than ever, and some VPNs facilitate set up on a router to get the service across your entire home network (and all the hardware connected to it). As well as routers, some providers support Linux, and indeed offer browser extensions for the likes of Chrome and Firefox. VyprVPN has a particularly expansive list of supported devices, including less popular devices such as the Blackphone, QNAP NAS (network attached storage), Anonabox and Boxee box. So when picking a VPN, be sure to examine the list of devices it supports, and ensure that your requirements in this department are met. Despite the allure and promise of complete anonymity online, the fact is that all VPN services do log and keep some user data for a certain period of time. They will also turn this data over following lawful requests by government authorities, as they have no desire to become a ‘partner in crime’ with someone who is breaking the law. Pricing is one of the most significant differences between VPN services, with some providers offering free plans, and others being relatively expensive. One point worth bearing in mind is that if you try a service on a monthly plan and find you like it, consider a longer-term subscription which will doubtless be considerably discounted. Some VPNs even offer lifetime subscriptions, such as KeepSolid VPN Unlimited which will give you access for the rest of your days for the price of $150 (£110) – assuming the company doesn’t go out of business, of course. Still, with a longer-term commitment, there’s certainly the opportunity for making some serious savings.